OK, let’s assume – which may be a big assumption – you’ve made it through Thanksgiving weekend safe and sound. That means you enjoyed family, friendship and a few holiday treats, but didn’t gorge yourself into oblivion. Great job; considering how many people give in (to put it lightly) to temptation when faced with a holiday feast, you’re to be commended. Now comes the hard part. You see, Thanksgiving was the first of what promises to be a smorgasbord of dessert-laden events to round out the year. Company party? Yep, you’re going. Dinner with the family? Check. New Year’s Eve, New Year’s Day and various happenings in between? You’ve already RSVP’d. Here’s how to avoid packing on the pounds this month as the holiday festivities continue with a few do’s and don’ts to consider. Don’t eat more than you usually do. If there’s one thing you’ve learned during this process of losing weight and getting in better shape, it’s that you’re in this for the long haul. The holiday season isn’t an excuse to abandon the healthy lifestyle you’ve cultivated all year, so don’t sacrifice your good eating habits now. Fill a plate and eat until you’re satisfied. Overeat and you’ll end up feeling guilty and sick to your stomach – a bad combination. Do enjoy a few treats here and there. You may not be eating more than usual, but that doesn’t mean you should avoid your favorite treats when they rear their delectable heads this holiday season. Healthy eating is moderate eating; it’s just as unhealthy at one extreme vs. the other. Turn December into a dessert month and you’ll pay the price; but swear off treats altogether and you’ll increase your risk of falling off the wagon. Don’t let a few “bad” meals spoil your month. Let’s say you’ve ignored #1 and #2 above, meaning you’ve eating too much at a holiday party, and most of what you ate was high-fat, high-sugar, high-carb or all of the above. No problem; don’t let a few unhealthy eating moments spoil your long-term health and wellness goals. No matter how busy your holiday season, you have many more days to eat healthy than unhealthy if you prioritize the former over the latter. Do bring your own dish to the party. You want to stay on the straight and narrow, but dread going to a party and facing table after table of nutrient-deficient, calorie-packed items. What to do? Help out the host and do yourself a service by bringing a healthy side dish or appetizer with you. If nothing else, you’ll be able to supplement what’s there with your offering to ensuring a healthier meal. Don’t bring home leftovers. We rationalize that we’re helping the host out by bringing home a few containers of leftovers, but all we’re really doing is ensuring the next day (and the day after that) are just as unhealthy as party day was. Enjoy the meal and then let it go; get back to your healthy ways and let someone else fill their fridge with a week’s worth of bad eating habits. Do think about the big picture. Healthy eating isn’t a phase, a step or a short-term goal; it’s a lifestyle that pays dividends you can see and feel. You’ve dedicated 11 months to fulfilling this promise to yourself, so why throw it all away now? 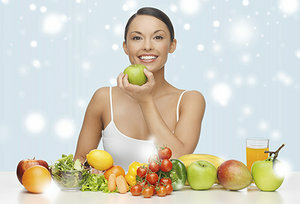 Think of the holiday season as just another opportunity to make sensible choices about your health. Before you know it, 2015 will be here and you’ll be stronger, fitter and thankful that you stuck to your guns for another year.